El Pulpo Mecanico warms up the crowd. If you were out for Arts Alive! 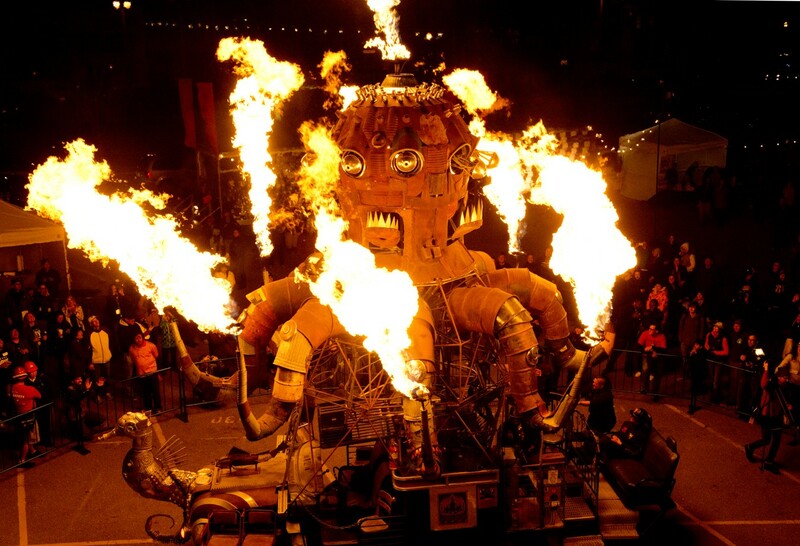 last October, you probably stood in the orange, propane-powered glow of El Pulpo Mecanico, Duane Flatmo's 25-foot tall, truck-mounted, scrap-metal octopus that shoots flames from its head and moving tentacles. It's hard to miss. 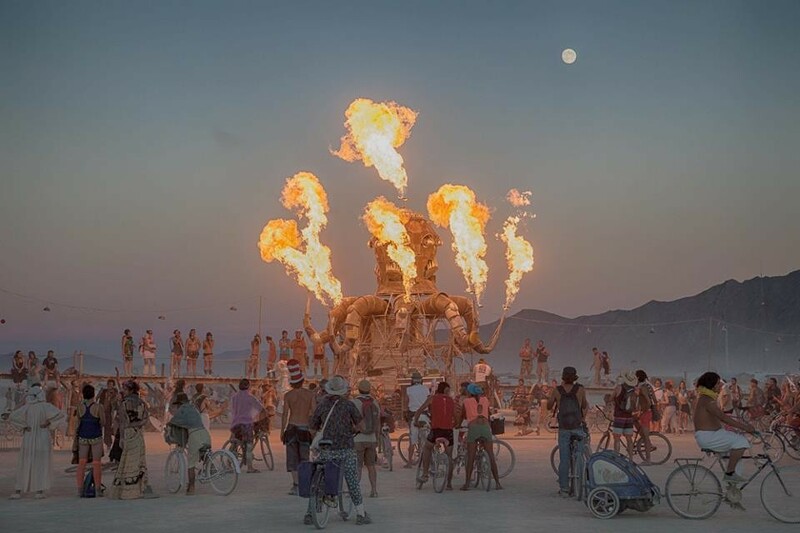 El Pulpo is hitting the road for Burning Man again this year, and Flatmo is once again running a Kickstarter campaign to fund the trip and the sculpture's necessary retooling. This year, it's going to take triple that amount, $12,000, to get the scrappy cephalopod to the desert. Flatmo is optimistic, and with good reason — as of this morning, the coffers were filled to $10,124. First, El Pulpo needed new wheels. They found a van at John's Used Cars and Wreckers "almost free," says Flatmo with a chuckle, and cut it down to fit the sculpture. Next, all the flame-shooting mechanisms had to be rebuilt, including roughly $6,000 worth of gas lines and other equipment. "It's amazing how much it takes to safely dispense propane," says Flatmo. And safe it must be, since it has to be approved by Nevada's DMV and the fire marshal. 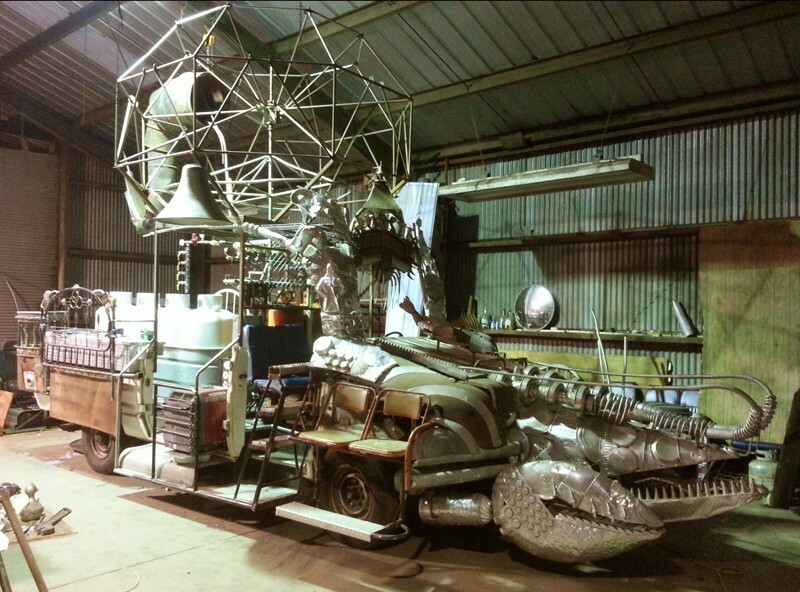 Flatmo expects that he and electrician Jerry Kunkel will be scrambling until it's time to load the 15-20 pieces of El Pulpo onto two flatbeds and drive to Black Rock City, Nev. There they'll have four days to put it all back together before Burning Man starts on Aug. 26. They'll also have passengers to pick up. Donors to the Kickstarter fund get El Pulpo Mecanico stickers, hoodies and other souvenirs, but big spenders ($1,000) get to ride shotgun around Burning Man. Those rides are already sold out. Among the VIPs are newlyweds planning to celebrate their wedding on El Pulpo. Burning it up at Burning Man 2012. This may be the last ride for the hunk of burning art, as Flatmo has other projects in mind. Unlike the Kinetic Sculpture Race, he says that building projects like this, "I don't have to think light." That frees him up for all kinds of things. Next year, maybe "a monstrous Pegasus," he says. He imagines it galloping across the desert, shooting fire from under its moving wings and out of its great, flaring nostrils.